As some of you know one of my most recent investments is Zonga, the leading streaming music service in Romania a spin off company of Trilulilu. Zonga launched in October of last year and in less than one year it has already become the streaming music service for Vodafone Romania and received an investment from the same company. It also won several awards and as you can see from this info-graphic it is gaining some nice traction. Zonga also recently launched a much-improved Android version (the previous version was its weakest point) a few weeks ago that I really invite you to try if you have an Android device. Being an avid user of both Spotify and Zonga, I was impressed to see that the Zonga Android version actually feels much better than that of Spotify. But then again Zonga also had a browser version well before Spotify. Now that Sergiu Biris and his team have gotten the Zonga overall experience to the quality level that they wanted, its time to expand. The quality of the Zonga platform and its full service for the lowest cost approach has generated lots of interest not only in Romania but also abroad. This is why we are looking for a chief commercial officer to join the Zonga team and fully run the commercial side of the business so that Zonga can capitalize on these opportunities. So if you are a senior results oriented commercial person with experience in doing large business development deals at the highest levels with multinationals as well as capable of working with the operational teams of these same companies and account manage these relationships for maximum results, please get in touch. We can build a very good package including stock options for the right candidate. You are results oriented, entrepreneurial, pro-active, and super driven, a “closer” with great account management skills and understand the opportunities as well as risks of working in a start up (this is a hands on role and fast results are expected), get in touch, this is an incredible opportunity for the right candidate. The job will be based in Bucharest with frequent travel to Cluj (where the product team is based) and abroad for business development. I was pretty excited a few weeks ago when Trilulilu, the company where I am chairman and one of my largest angel investments, soft launched its streaming music service Zonga.ro with Vodafone! We also announced that Vodafone had taken a 15% stake in Trilulilu´s music subsidiary Trilulilu music. This is a huge vote of confidence that a company such as Vodafone would make such a move and select a Romanian company to offer a music streaming service to its customers for the first time worldwide. This is great for Vodafone who gets a great service for its customers and also lots of goodwill by showing that it has the vision to find great teams and start ups no matter where they are located in the world and as a result in this specific case, support the Romanian start up ecosystem. It is also great for Trilulilu and Zonga of course who gain a very important strategic partner that will significantly boost its growth potential. Finally it is also very good for the local start up ecosystem that in my opinion needs to gain credibility and traction, not just with more funding deal announcements or exits (still very rare) but also by having start ups that like Trilulilu evolve to the next stage and become credible enough so that they can partner and do truly strategic deals with the truly big boys. Good stuff and congrats to Sergiu and his team. Ps: Below I have added a quick intro video to the Zonga service and what it does. I have been taking it easy on the angel-investing front in the Romanian market for the past 12 months. Actually I thought I was going to stop investing in it for a while so I could better concentrate on developing existing local investments such as Trilulilu, (not really a local investment anymore) eRepublik and other smaller ones. This is because most of my investments locally have been very different to the usual spray and pray approach of angel investors. When I first started looking at the online market in Romania, about 4 years ago, the scene was dominated by large groups that saw the Internet simply has another vertical and just bought majority stakes in as many copycat projects that they could feed to their in house media houses. This with a few exceptions resulted in poor companies, entrepreneurs that became project managers, selling out their “dream” for a few ten of thousand euro (enough to buy an apartment at the time) and in some cases some nasty bankruptcies and unhappy investors. This created a lack of motivation and more importantly learning, a lost generation of Romanian entrepreneurs and low quality online companies with very little innovation or international potential. You can’t learn to become an entrepreneur in a big structure where your company is just a project of a larger group where you don’t hold equity. The moment you make that move you are an employee, not an entrepreneur. So although I wanted to take a different approach, a more Silicon Valley type of angel investing, taking minority stakes in great teams with interesting projects, I found it very difficult to find the right teams on the right projects. I kept receiving proposals either from people who thought starting a company and getting it funded was the same as selling a development project to a client or entrepreneurs who wanted to sell out before even having achieved real traction. There were some exceptions but very few, and one of the major show stoppers was many of the better entrepreneurs could not concentrate on just one project and would do several at the same time. I know what it takes to build up a great company and you can’t lead 2 at the same time (hard enough already to lead one and look after investments in others J. So I would always turn these down and advise them to focus on one company only and then come back. Of course very often this was not their fault, these entrepreneurs needed the income from one of the companies (usually in the development services industry) in order to fund the other. Problem is that they didn’t really realize that in order to get the funding they absolutely had to focus themselves and their team 100% on the new venture. The ones that had international projects, I advised to just go abroad, participate in international start up competitions and not raise money locally. A few followed that advice (no merit there, I’m sure they would have done it anyway without my advice), managed to raise funds (in some cases from personal friends of mine) and are making the right connections to make their current start up or the next one succeed, opening the way for other Romanian entrepreneurs. As a result of pushing this type of entrepreneurs with an international project to go to start up competitions such as LeWeb or programs such as Seedcamp, I may have missed the opportunity to invest in companies such as Ubervu or Brainient but I don’t think Emi or Vladimir regret having gone instead directly to Seedcamp. 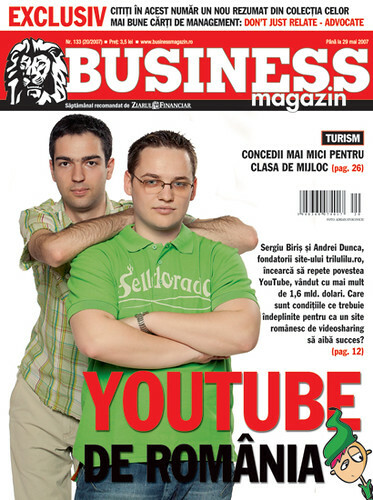 They had the type of project that simply would have been way to hard to turn into a major success just from Bucharest (Congrats again btw guys). to all other sugar daddies, Seedcamp sounds like a good European candidate for a similar deal), although I do worry when things start looking to much like an incubator. I do believe that entrepreneurs having to deal with all the sh*&t you have to deal with when you are bootstrapping with few resources for a certain amount of time are usually stronger as long as they manage to take themselves out of that situation fast and without someone having to hold their hand. My first Investments in Romania: People and focus. In time I found 2 entrepreneurs with personalities, backgrounds and projects that I felt had real potential, but they were very different ones. One, was George Lemnaru his project, eRepublik simply didn’t exist, it was just an idea we discussed whilst I was meeting him for something totally different (an online e-commerce website), everything needed to be done, we actually even changed the concept quite a lot in that first discussion and it needed to go international right away to have any chance of success. This was not something I could simply invest a minority share in and advise from time to time. If the prototype phase demonstrated the potential, it was clearly a project that would need significant funds to grow. And demonstrate it did! Within 10 days of launching we had 10.000 players from 30 countries and our first hacking attacks and crisis. The result is that having raised substantial funding on top of my initial investment from international external investors, eRepublik is by far the company where I am the most involved, holding the CEO role and I am really enjoying the ride so far. Focus on one company = practice what you are preaching; I owe it to the other investors who have placed their trust in us as well as to the greatly talented and dedicated team we now have. eRepublik’s growth although not free of hick ups and major challenges: hacking attacks, team building trough trial and error, design errors… you name the crisis, we probably had it at one point or the other; has been great. eRepubik now has over 2,2 million registered users from all over the world and growing (yes many are no longer active but that’s the measure all browser games give). It is a truly international company with offices in Dublin, Madrid and Bucharest and a team of 30 great people that have acquired considerable experience and know how and more importantly work great together. Less than 5% of eRepublik revenues come from Romania and we have sales in over 120 countries. As a part of this, it has been a challenging but rewarding experience to build from scratch with George Lemnaru an online games development studio in Bucharest. I’m looking forward to taking eRepublik to the next level now, leveraging what we have achieved so far. The other was Sergiu Biris; Trilulilu’s story is different, by the time I had spotted Trilulilu (through a cover story on a local magazine: “Business Magazin” it was 11 months old, one of the top 15 sites in Romania, already had buy out offers on the table and virtually no revenues. Still, in that case, the initial idea was to actually simply be a minority investor and do an angel play. So I took a 10% stake in the company. The team was great, and the project had clear traction, it was a no brainer. I had not counted with the fact that within 6 months there would be new offers on the table to buy out the company. Although the offers would have given me a great return on my investment, working with Sergiu Biris over that period, I just knew he could take Trilulilu much further, so I simply decided to replace that offer taking a majority stake in the company but leaving a significant share to the founding team and Sergiu in particular. Again Trilulilu.ro is not your typical angel investment since I also took the non-executive chairman position and although my role is much more limited to the one I play at eRepublik I am more involved in the company than a typical angel investor. Still I make sure that this does not represent more than 24 hours per month. My international expertise is much less needed here, so Sergiu pretty much runs the show and I play more of an advisory role stepping in only when I can truly accelerate things. Trilulilu.ro is a very different company to eRepublik, at the moment it is a truly local play, the largest Romanian site according to SATI with over 3,5 million unique users per month. I am really impressed by how it has grown and what Sergiu and the team have achieved and what they are planning. I am convinced that Trilulilu.ro will surprise many in 2011 and seriously leverage the leading position it has built. This means that so far, although I wanted to do at least 2 investments per year locally, I only managed to do one small real angel investment in Romania: 123Flori.ro where I simply liked the entrepreneur: Mircea and followed the hunch of Alexandre Almajeanu a great angel and friend who was the lead investor. I follow 123Flori.ro from a distance but I am pleased to see the progress of the company in what is still a small market that is ripe to grow substantially over the next few years. So this is why I am really happy that I have finally found another company with a great entrepreneur focusing 100% on a high potential project to invest in: Tjobs. Basically I think it’s a great entrepreneur & team with exactly the right background taking an innovative approach in a market that already has a proven business model (online jobs) but was not being done properly online for that particular segment (providing jobs abroad for Romanians). Tjobs will have many challenges ahead but I am confident it has a good chance of being a major success and it is already showing great traction. More importantly perhaps, it will change many lives for the better and give many Romanians the chance to find employment abroad much more easily, in a safer more efficient and transparent way and with better conditions (the “T Standard”). Thousands of people have already seen their life change thanks to Tjobs. Clearly the Romanian online market is maturing. Andreas Cser another fellow angel investor and friend, spotted T-jobs at the Biris Goran first Venture connect event in June 2010. I had seen it to and found it interesting but I was to busy to follow up properly and Andreas is the one that really followed trough and convinced me to co-invest. ontrol and access to wider know how when needed. The fact that such deals are now happening in Romania is a clear sign that things are finally moving in the right direction and entrepreneurs more mature. Although I first saw Calin Stefanescu pitch Tjobs.ro last summer, from the moment Andreas was in, it only took me one face to face meeting with Calin and a phone call with Andreas on terms to make athedecision to invest, 1 week. The fact that the paperwork was handled by a law firm that knows the space (disclosure Biris Goran advise Erepublik and Trilulilu in Romania as well as other companies I am involved in) made a big difference. The gain of time was considerable for all parties involved. The emergence of events like Venture Connect in Romania is in my opinion key; they really give entrepreneurs a platform to learn to pitch to investors correctly (and prepare for larger start up competitions) and for investors the possibility to see quickly what the Romanian online Internet start up scene has to offer. I strongly recommend this type of event in particular if you have a local early stage start up project. But very few international investors will be interested in a local early stage start up, they want to invest either an international market play or in mid to late stage growth plays. Actually I think that in the next 18 months we will see several growth investments in local leaders. We will also see the first trade sales or partial exits above the 10 million euros mark. Several investment funds and companies are turning their attention to the Romanian online market and a few start-ups are reaching substantial sales levels and reach. Romania is after all the 2nd largest Eastern European Market in the EU after Poland with 22 million people and has one of the best broadband services in the world. In Romania, a lot more value is going to be transferred from the offline world to the online world than most people think particularly but not only for advertising and e-commerce. One simply has to look at what has happened in western countries. This means that if you have an early stage start up you should either focus on the international market or practice and eventually get your first investors (preferably ones that are truly well connected internationally) in local events but quickly put yourself in a position to pitch and eventually move to London or other such emerging European internet hubs. If you have an early stage start up focusing on the local market, there are investors for great teams with great projects that sow initial traction but you will have better chances of scoring investment in local events either from local angels (and here are very few good ones still) or from the few international angels that travel to these and may be interested in a local market play. But you need to have a clear shot and vision to reach the growth stage very quickly because that is where the action will be locally. And remember with TJobs done, I still want to make one early stage investment in 2011 in Romania and two in 2012 so don’t hesitate to contact me if you think you have what it takes to be the next big thing (I prefer B2C to B2B).